I needed to bake something egg-free for a friend recently. All I could think of was shortbread. Boring. 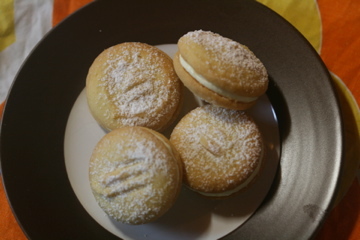 Shortbread sandwiched around tangy, creamy icing. Now you’re talking. This whole batch of biscuits cost about the same as one melting moment from the sweaty jar at the local cafe. These were perfect! Yummo and super easy and quick to make. I had to tweak the recipes I found to suit my ingredients. This is what I came up with. Beat butter, vanilla and icing sugar until fluffy. Sift together plain flour and cornflour and add to butter mixture in three batches, folding through. Place small balls of batter about 2 cm’s apart on a non-stick baking tray and flatten with a fork. Alternatively, you can pipe the mixture onto the tray, using a wide circular nozzle. I did the latter and got nice, evenly round biscuits. Bake for 12-15 minutes at 170 degrees. Cool on cooling racks. Be careful moving the biscuits as they are quite soft and breakable while warm. Cream all ingredients with a hand beater or free standing electric mixer until very pale, light and fluffy. Refrigerate until biscuits have completely cooled. 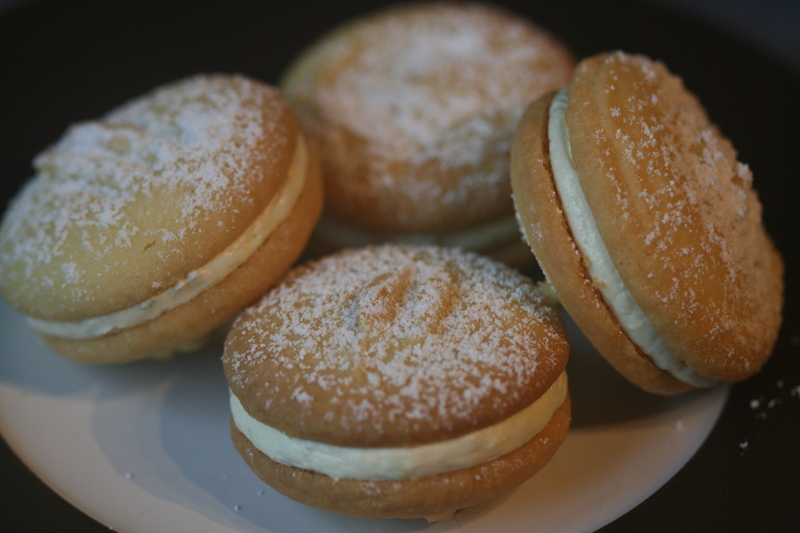 Pipe a dollop of icing onto one biscuit, then simply sandwich together with another. The butter cream will still be soft. Refrigerate for ten minutes or until firm so they hold together when eaten. Store in an airtight container in the fridge. Oh these look amazing. Could you make a batch for your dear, Melting Moment-deprived Mother? These look and sound so good. I am addicted to limes! 🙂 You made such perfect little round shapes!